Are you considering upgrading your attic insulation or replacing your windows? Before you spend money on individual improvements that might not make a difference, why not learn exactly how your home uses energy and where it's being wasted to choose the best upgrades for your home? 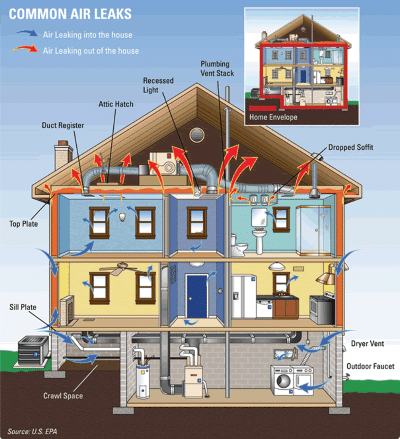 That's exactly what you'll get with a home energy audit from Jack Hall Plumbing & Heating. During a home energy audit (also known as an energy assessment), a Jack Hall Plumbing & Heating specialist will use various tests and inspections to determine the efficiency, safety and function of your home's major systems. Our experts may also use special equipment - such as a calibrated blower door and thermal imaging camera - to find sources of energy loss throughout the home (particularly in the attic and basement). Based on the results of the whole-house assessment, Jack Hall Plumbing & Heating can then provide a detailed report, showing you exactly how your house is using energy and where energy is being wasted. The report will also show which energy-efficiency upgrades should be done and in what order. We complete visual and safety inspections of insulation, heating and cooling systems, ventilation and ducts, water heater, lighting, and the building envelope. A blower door test helps uses a special fan to depressurize your home and locate air leaks. Blower door tests are typically performed both before and after air sealing to measure the effectiveness of the air sealing work. Why should an energy audit be the first step? There are many systems throughout your home that interact to determine your home's comfort, energy efficiency and health. When one system isn't functioning like it should, this will affect all of the other systems. For example, leaky ductwork will force your HVAC system to worker longer and harder to maintain comfortable temperatures, and this means you will likely pay more on your heating and cooling bill. If you know that you need to replace your water heater or upgrade your insulation, simply give us a call to get a free cost estimate. If you are unsure of where to start, a home energy audit can help identify the weak areas in your home's energy profile, enabling you to make key upgrades that will have the most impact on energy savings. Don't guess at what your house needs to be more comfortable and energy efficient. Get the answers with a custom energy evaluation from Jack Hall Plumbing & Heating. We offer professional energy auditing services and home energy upgrades in Glens Falls, Saratoga Springs, Queensbury, and surrounding areas in New York. Contact us today to schedule your energy audit!